French: Cassique de Montezuma; German: Montezumastirnvo-gel; Spanish: Chacarero de Montezuma, Oropéndola de Moctezuma. 15-20 in (38-50.5 cm); female 7-9 oz (198-254 g), male 12.5 oz-1.2 lb (353-528 g). Sexes similar in color. 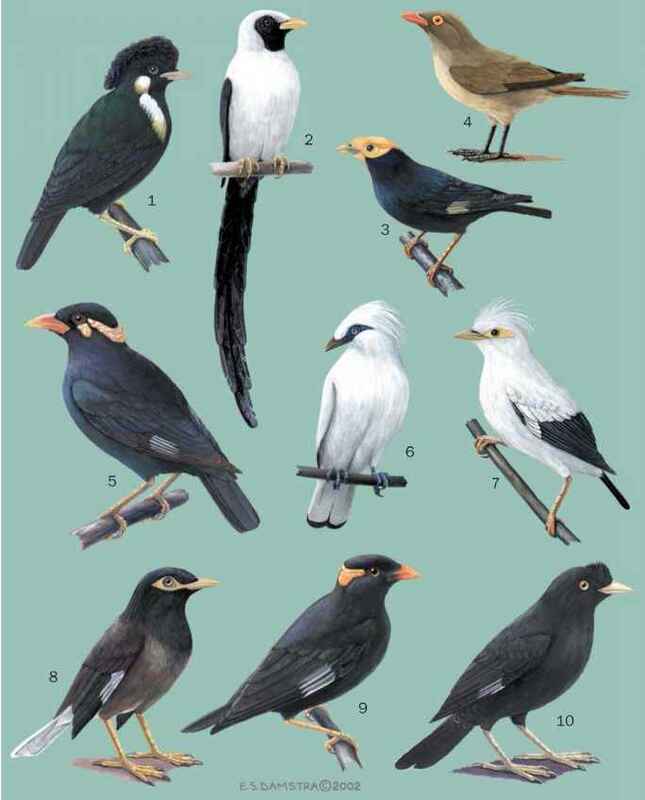 A large chestnut oropendola with a black head, a bare blue cheek patch, a small pink patch at the base of the lower bill, orange-tipped black bill, and yellow lateral tail feathers. Tropical lowland forests and secondary forests, to 3,300 ft (1,000 m). During the breeding season they are highly colonial. Females forage away from the colony in small groups. Males often feed solitarily. Males have an elaborate courtship display: they bow forward, pointing their bill downward, and fan their tail, while uttering a characteristic vocalization. Forage in trees; their diet is almost exclusively fruit. Highly polygamous; successful males mate with several different females. Females weave a long basket-like nest of grasses and other fibers, which is suspended from the tips of branches of a tree; nests are up to 47 in (120 cm) in length. Oropendolas are highly colonial with over 60 nests in some colonies. Nesting trees are characteristically tall trees that are away from other trees (so that it is difficult for monkeys and other arboreal predators to get to them). Generally two eggs are laid January-May. Incubation about 15 days; young fledge about 30 days. Not threatened. Montezuma oropendolas are locally common on the Caribbean coast of Central America, but generally local on the Pacific coast of Nicaragua, northwestern Costa Rica, and Panama.